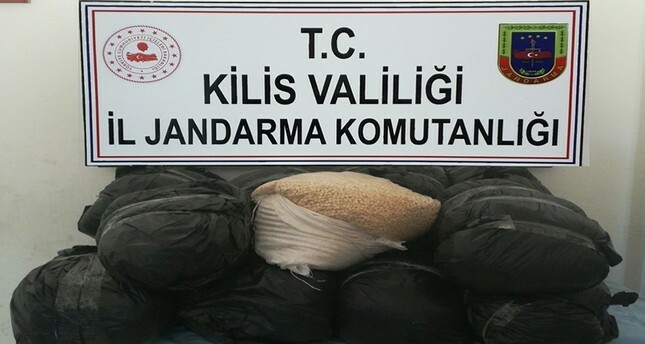 Turkish security forces seized a large pile of opiate drugs belonging to the PKK terrorist group and its Syrian offshoot People's Protection Units (YPG) in an anti-smuggling operation in southeastern Turkey's Kilis province near the Syrian border. Acting upon intelligence, the Provincial Gendarmerie Units and Border Units have found a total of 1.5 million pills in five sacks in a minefield near Çerçili village in the southern province of Kilis near the Syrian border. The authorities continue to search for the suspects, reports said. Turkish police are experienced at dealing with international drug trafficking, as the country lies on a transit route for drug smuggling between Asia and Europe. Turkey is also fighting a rising case of drug use, especially among youth, and has stepped up anti-narcotics efforts in recent years. The Interior Ministry recently announced that security forces carried out more than 134,000 anti-narcotics operations in 2018 and captured nearly 80 tons of cannabis, 19.6 million Captagon pills, 7.8 million Ecstasy pills and more than 15.9 tons of heroin. Terrorist groups, particularly the PKK, have exacerbated the booming drug trade. The PKK is accused of smuggling drugs to and from Europe as well as cultivating cannabis in southeastern Turkey as a way to fund its illegal activities. In 2018, Interior Minister Süleyman Soylu said the PKK terrorist group controls 80 percent of the drug trade in Europe, earning around $1.5 billion per year.